I can't tell you how excited I am that it's Friday. It's Blossom Festival Weekend here in our little town, so there are so many fun activities scheduled to take place. The next few weeks are going to be jam packed with all kinds of party fun around town and for us as a family. Nothing like going out with a Bang, huh? I am planning several parties myself with a birthday party, a goodbye party, and a soccer team party all in the next few weeks, in between all the packing and moving. So fun. But at least it keeps me busy and from stressing over little things. I enjoy throwing parties so it's be a nice destresser. 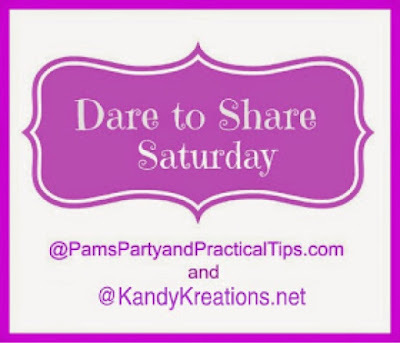 I was thrilled to see so many party posts at last week's Dare to Share Saturday linky party. Thanks for your inspiration. It really put me in the mood to get some planning and preparing done for my parties. If you missed them, check out these three awesome party posts.